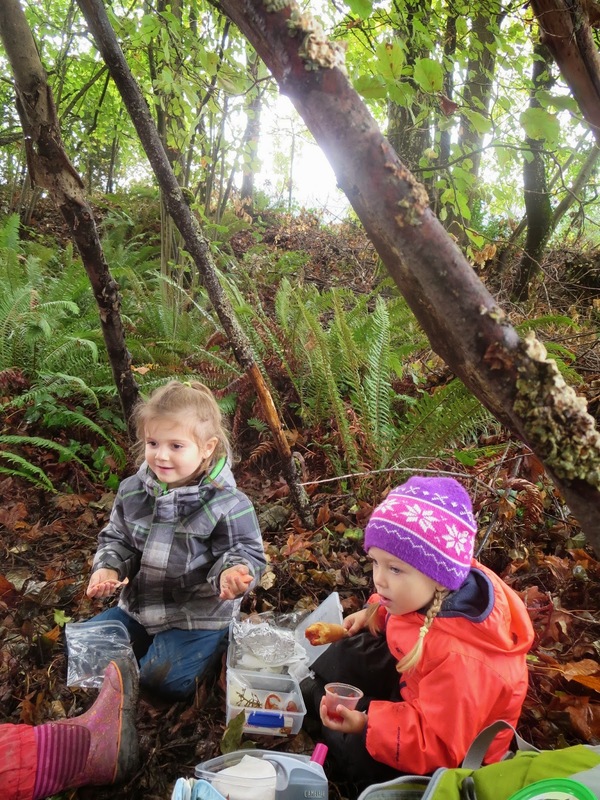 Every Thursday we head out for our “Urban Forest Hike Day”. This day has become the most treasured day of the week. 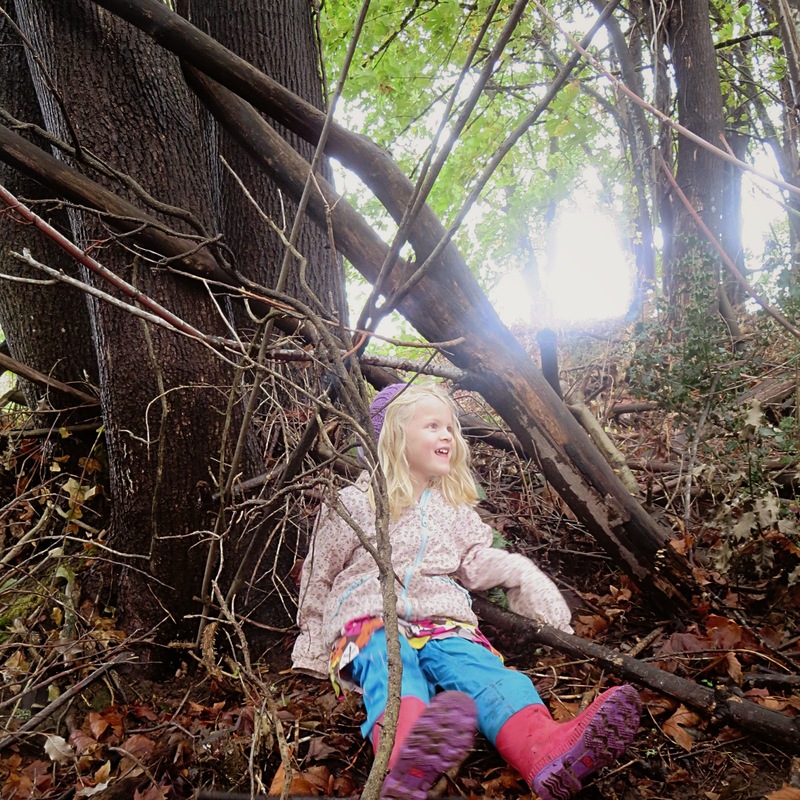 We have grand adventures where our circle time and story time come alive for the children as they explore nature. We are blessed that our school is just two blocks from Baltimore Woods, a native woods area that is under restoration. The woods features such trees as Oregon White Oak, Madrone and Broad Leaf Maples. The woods provide shelter to a variety of birds, mammals and insects. Here is a collection of pictures from our Hike Day to give an idea of why this day has become such a treasure. 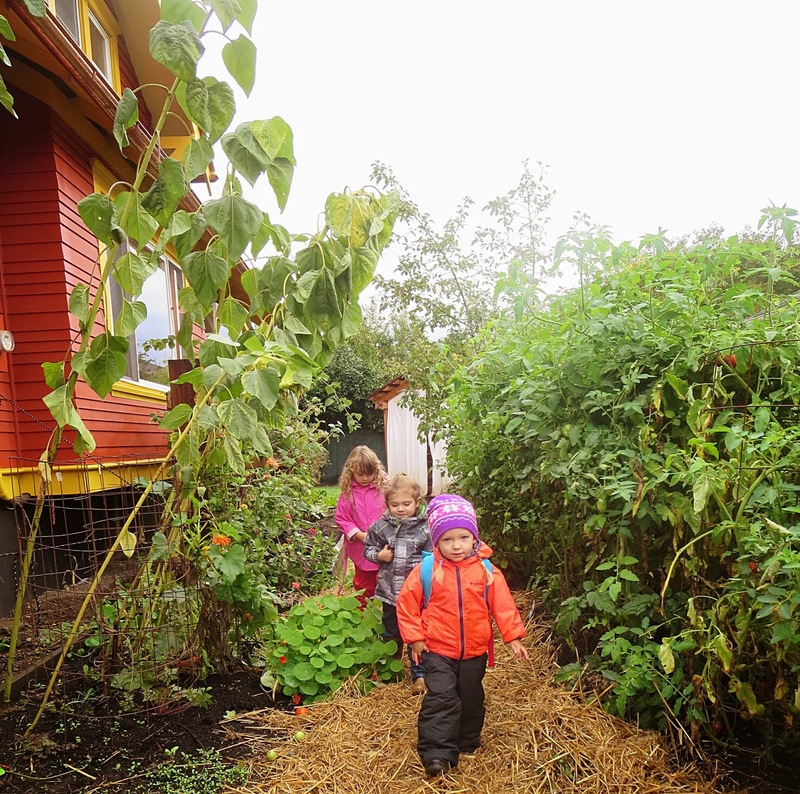 Heading out for Hike Day through the Fall Garden. As we head out our transition song is “A Hunting We Will Go” and the children all join in quickly with the tune excited for the adventures that await them. On our way to the “woods” we travel through this canopy of Maples often at first holding hands. This passage provides what, to the children, feels like a cavern. In this “cavern” gnome and lantern songs and verses come alive while we “make our way” through. The verse “Trip trip trap, trip trip trap, Go the gnomes along their track, Through the caverns make your way, Find your King as well you may” finds it’s way to the surface often even though this was our Late Autumn Ring Game (found in the book Autumn by Wynstones Press). 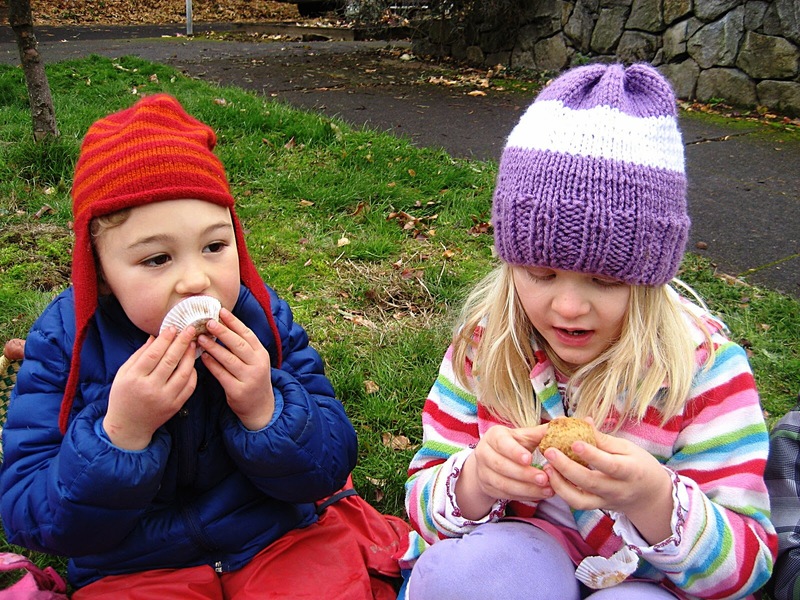 On our way to the woods we stop for snack most often at a tree the children have named “Snack Tree”. It is a Japanese Snowbell and it shares it shade with us on sunny days. On Hike Day Mr. Golden Sun is our blessing candle and our blessing is shared with such reverence in this open space. As we enter Baltimore Woods we are greeted by this open wildflower meadow. The children are quick to come up with games of chase where they imagine dogs, sharks, bears or monsters at their heals. 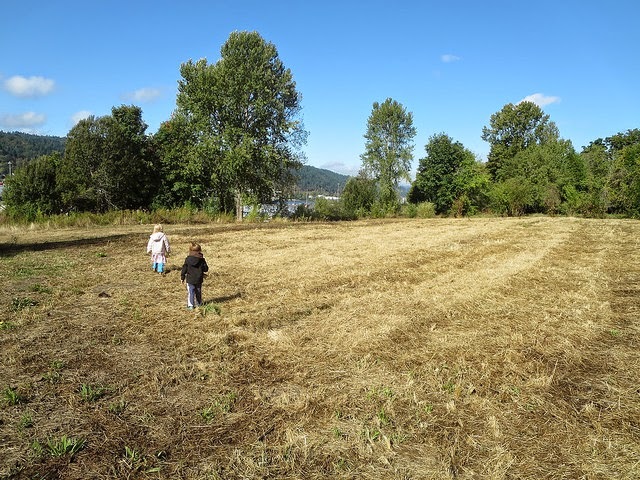 This large open space reminds them of their own small size and soon their energy shifts to a deep in-breath preparing them for the magic of open space based deep play. For more on “deep play’ I suggest the book Simplicity Parenting (page 140). The children run for this spot first and once they have arrived, they exclaim, “We made it!” as if they have overcome a great trial. They call this the sap tree as there is a hard ball of sap coming from the tree where a limb has broken off. It is a delight to see the sap grow and change through the seasons. 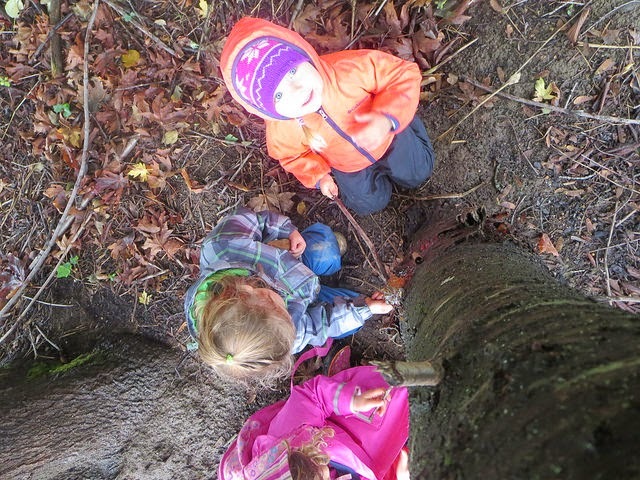 The children attempt to remove sap at every visit regardless of previous failed attempts. Different “tools” are found in the woods to work at this project. Next our journey takes us along a path that is lined with tall Broad Leaf Maples on one side and native grasses along the other. To the children this span feels like a long hike into deep woods although it is about the length of a city block. This long open path allows some autonomy as I can see the children even if they have run ahead or are taking their time enjoying a slow journey. We all meet up where there is a small hill the children climb to and each proclaim “I am King of the mountain”. Now we come to a condensed area of trees, ferns and downed limbs. This is where deep play comes alive and the children imagine they are many different things from squirrels tucked in their homes for winter to deep sea divers touring the depths of the ocean. This area provides uneven terrain where the children can develop their sense of balance, stimulating their vestibular system and their sense of proprioception (awareness of where their physical body and it’s parts are in space). As we return each week the children find their bodies more and more able to manage the varying landscape. 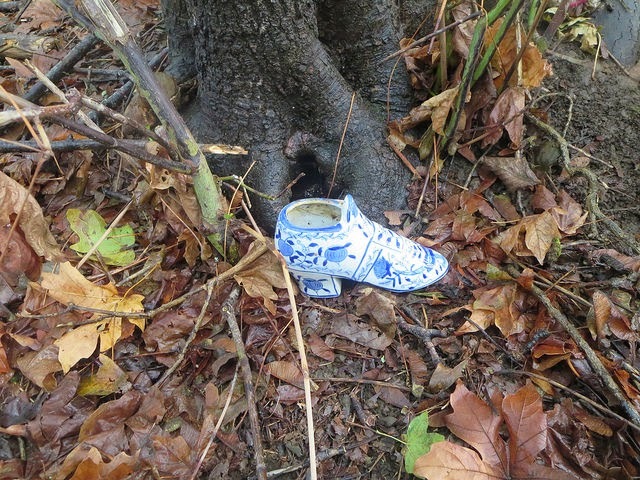 Many treasures are found in Baltimore Woods from earthworms and rolly pollies to this china shoe. We hide this shoe in a different spot at each visit and upon returning are challenged to remember where we left the shoe. 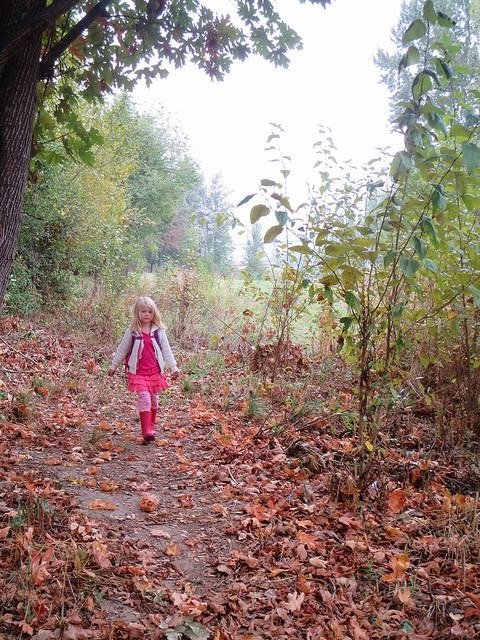 As the seasons change, the landscape changes also and the children find searching for the hidden shoe a hunt worthy of our their energy. We built a fort and are surprised it remains intact at each visit thus far. This visit the children were so immersed in deep play we stayed for lunch and ate in the fort. On this day the fort was actually an air pocket where we could remove our deep sea diving masks and enjoy a meal together. The imaginary masks hang over our heads awaiting our return to the deep sea. As we return to the school we are greeted by neighbors who are becoming more and more familiar to us. Neighbor Uncle Dan is often in his garden and is delighted to see the children. 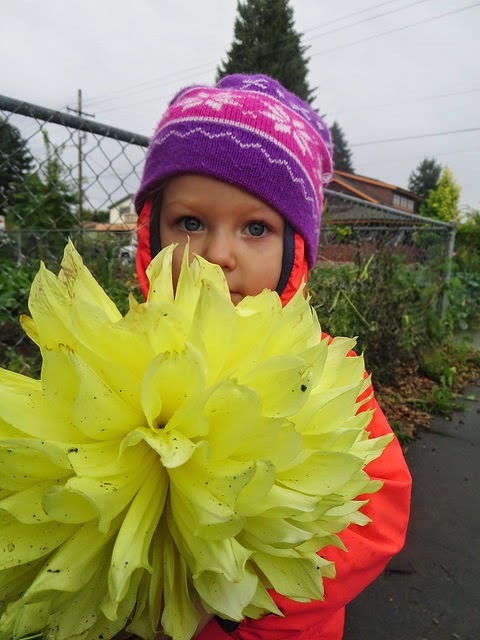 He presented us with this dinner plate Dahlia and one of our smallest LittleRoot Children took great pride in carrying it back to our school. 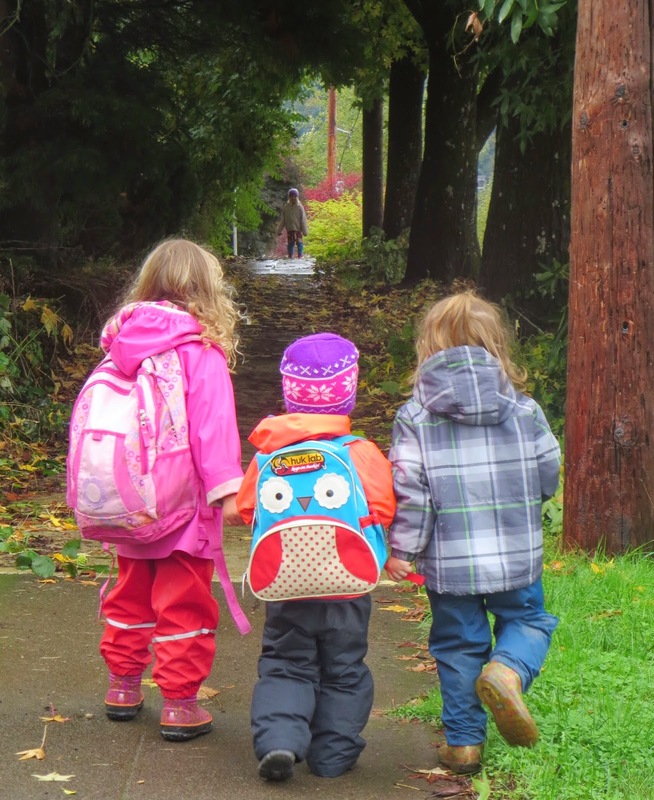 While we walk through the neighborhood to the woods and back we sing Ella Jenkins’ song “A Neighborhood is a Friendly Place”. We are sure learning the truth of that song thanks to neighbors like Uncle Dan.